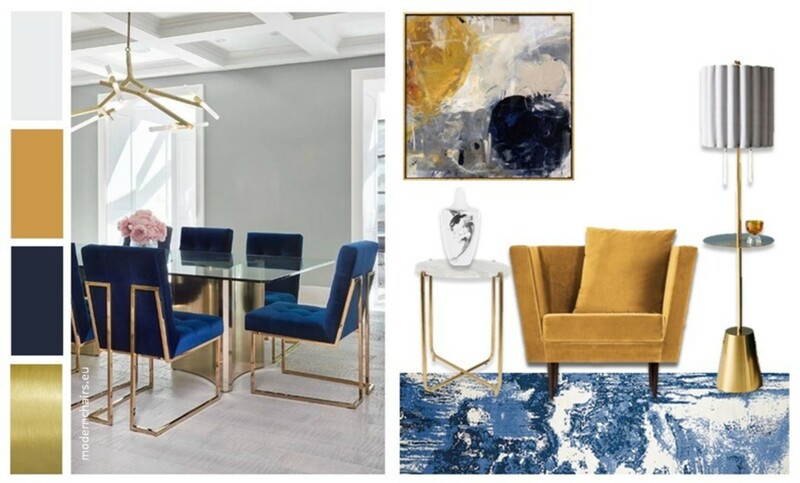 Jourdan Dunn: A beautiful dining room in blue and mustard. Jourdan Dunn is a bona-fide star; she is iconic in the fashion world, a complete globetrotter, devoted Mother, astute chef and positive mental health advocate. We thoroughly believe that a home needs to portray the personality of it's occupant, and there was no doubt that Jourdan's would be absolutely beautiful and full of character. You can shop her entire look on our Shop The Looks page. Jourdan's dining room brief was clear and concise. Competent in the kitchen, this is going to be a space that Jourdan spends a lot of her time, so it needed to be comfortable, practical, stylish, and above all, make her happy. We needed to source a glass table, create a cosy seating area, and add some WOW factor finishing touches. 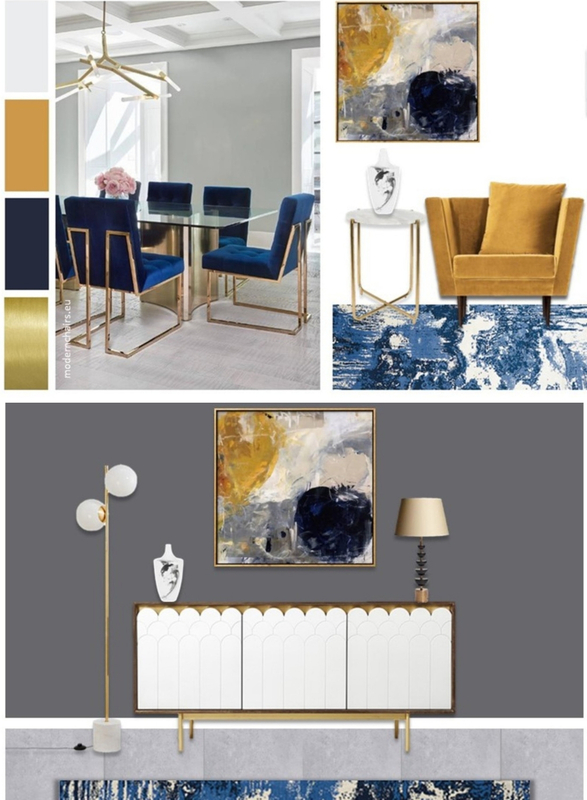 Statement light fittings would take the limelight whilst brass finishes and velvet upholstery in rich colours would complete the scheme. You can view all these items in our Shop The Look, so you can recreate the supermodel star's style in your own home! Take a look at Jourdan Dunn's full Dining Room Design here. 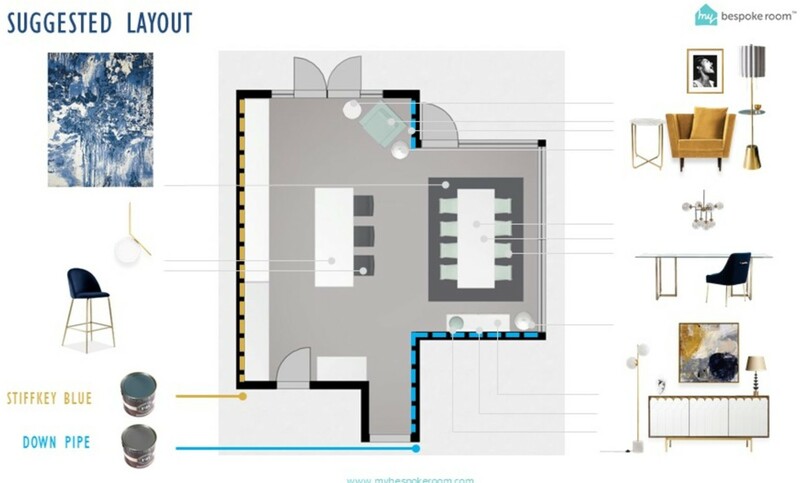 Layout is crucial in any room design to make sure it looks great, but is also functional. 'Flow' is a word that gets thrown about in interior design, but it basically means you can move freely around room like a river meandering across the countryside - pretty romantic ey? Jourdan has a open plan kitchen & dining room, which leads out into a gorgeous outside space. We needed to make sure there was a dedicated dining area, a cohesive transition into the kitchen space (that's where the velvet kitchen stools came in! ), and a seating area next to the original window that looks out into the garden. If you're looking to achieve a good 'flow', then there needs to be enough free space to move freely around the dining table when the chairs are pulled out. You also want to ensure there's a clear and straight walkway from the room entrance, right through to the double doors leading out on to the garden, whilst also still leaving enough room to manoeuvre around the kitchen and seating space. 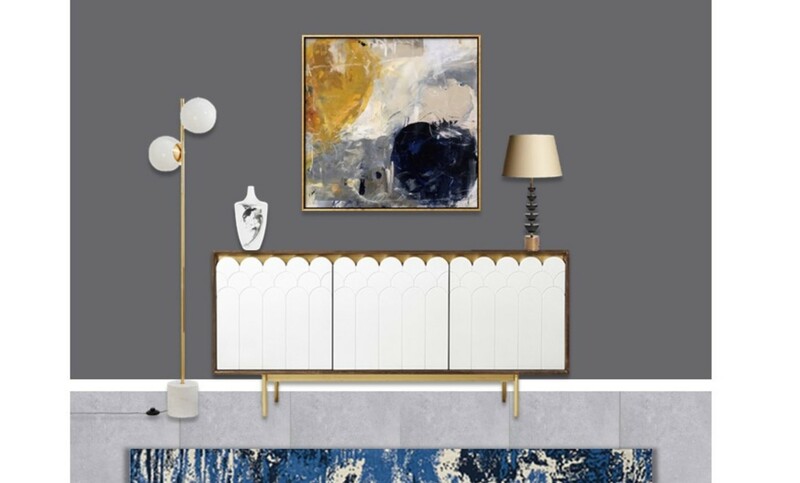 In the design, we included a sideboard for some extra storage (as well as because it's beautiful), and a large piece of statement art to pull the whole scheme together. We created a 2D view of Jourdan's room so that she could visualise what the space would like when it was brought to fruition. It's always impressive being able to see the furniture items on the shopping list brought together in situation in the 2D visual - check it out for yourself on our Shop The Look pages. We always love seeing the 'after' pictures of our room design transformations. 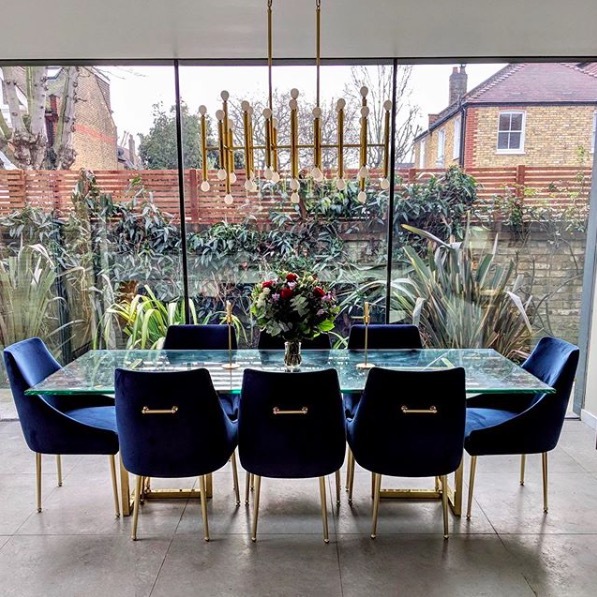 Jourdan posted her dining table and chairs with the feature light fitting on her Instagram account and it looks as divine as we knew it would. We can't wait to see more photos! If you have fallen in love with the supermodel's star style as much as we did, you can find all the products, from furniture to finishing touches, on our Shop The Look page. Watch this space because we'll be sharing some more photos of Jourdan's home incredible home soon. Keep your eyes peeled for the ultimate A-lister room reveal!